Get your district’s good news ready! ASBSD wants to hear what your board members, administrators, teachers, staff members, students and community members are proud of for the fourth edition of The Good News Bulletin. Over the last three years more than 90 districts have submitted nearly 200 stories of student achievement, community engagement, exemplary staff members, collaboration among districts and much, much more! Download and read the Good News Bulletin’s first edition, second edition and third edition. “Each year the Good News Bulletin has grown with stories about what makes our public schools so great,” said ASBSD Executive Director Wade Pogany. Share your stories and story ideas with ASBSD, along with a photo, by Friday, Feburary 3, 2017. Send stories, photos and any questions you may have to Tyler at tpickner@asbsd.org. 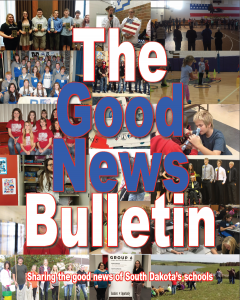 ASBSD will print and distribute the latest edition of The Good News Bulletin statewide in 2017. Join us in sharing the good news from our South Dakota schools!